Piergiorgio Giorilli is a baker in a league of his own. His years of experience and effortless skills speak volumes. He is a true master! I have known of Giorilli for sometime now, yet I haven’t until now made a panettone in accordance with his methods and formula. Processing of the mother dough is a skill that requires tuition and above all else, experience. Giorilli opts to maintain his madre in water during the standard 12 hour period. While as typical, before proceeding to the first dough three refreshments are made lasting 4 hours each time. From Giorilli.com I sourced his recipe. 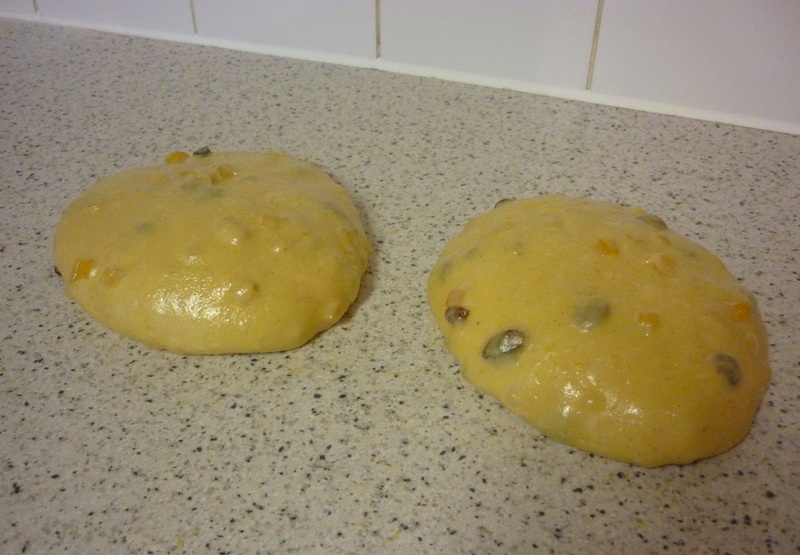 I adapted his formula to make two 500 gram panettoni, flavoured with the traditional sultanas, orange and citron. bake Michael.- just perfect. It is getting to be panettone season again but I'm not looking forward to tons of white starter discard to get my rye sour starter anywhere near where it should be :-) Maybe I should try my normal 3 stage white build with it and no discard and see how it goes? You could simply save the discards. Put them in a pot and store in the fridge. I'm sure you could easily use them up over time. 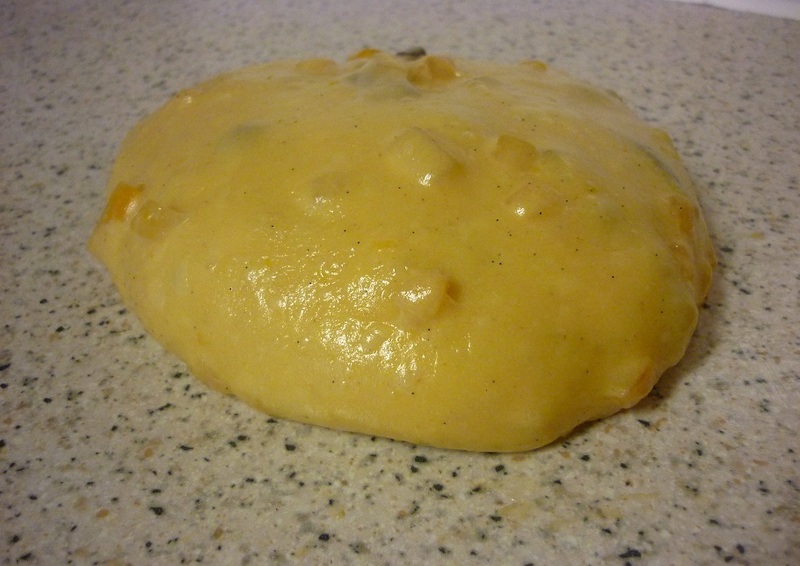 I have been away recently and I left my starter in the fridge for well over a week. The majority of it had melted into the water it floats on. It has taken a couple of days to bring it back to health and maturity. That's about 6-7 strategic feeds. 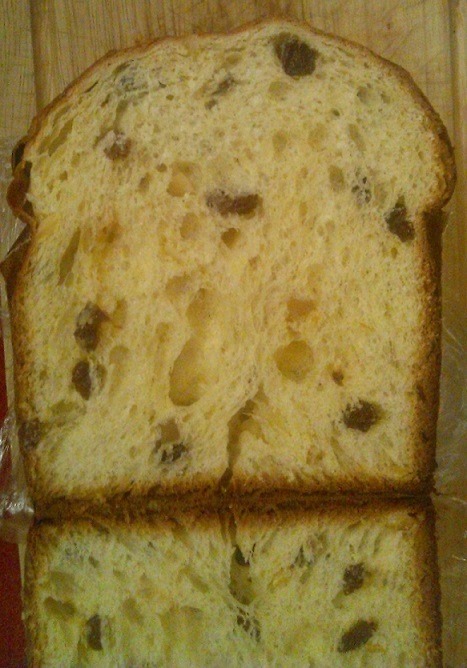 To get a good panettone, the starter needs to be "just right". The acidity needs to be low and balanced as this will effect fermentation and the rheological properties. pH should be somewhere between 4.1-4.8. It should be able double it's volume in two hours rising up and out from the centre when cut with a cross. Be aware that if you use you're own method to raise this dough you may encounter problems. E.g. 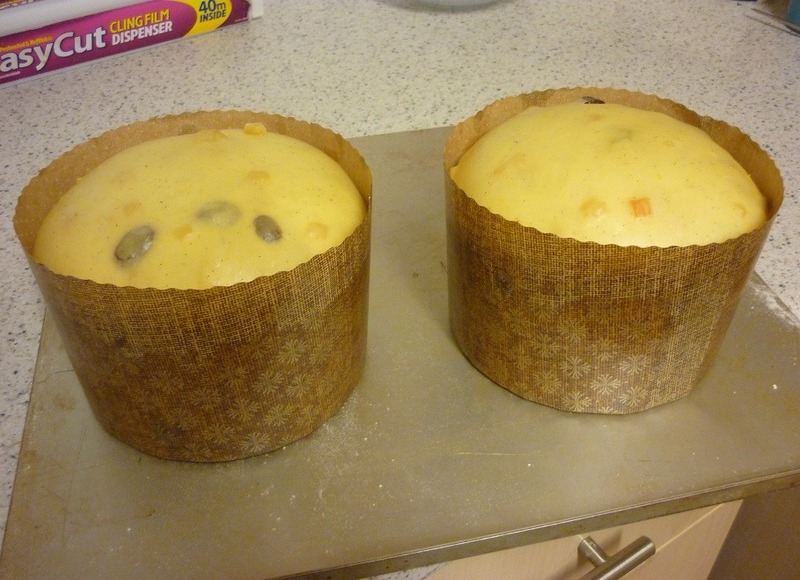 I don't want your panettone to fall out it's mould when cooling!!! To much acidity or too high a bacterial load will cause this... Just so you know! ...and no doubt, delicious. 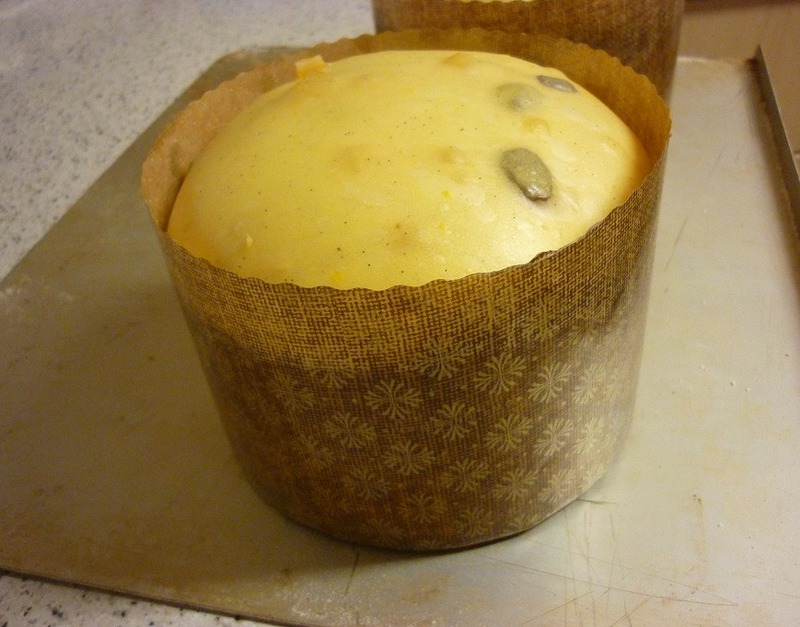 I must try baking panettone this year, bought papers after last season, but must admit to feeling a bit intimidated. I can understand your intimidation. But if you focus on the key points I mentioned above I'm sure success is within your grasp. I would be honoured if you give it a go, like I say it's a forgiving formula. Thanks this new addition your panettone bakes. That's kind of you to say. I just seem to have a passion panettone. I think because it's so technically challenging. Belive it or not some pastry chefs make panettone with wholemeal flour. Rolando Morandin is one. see hear. 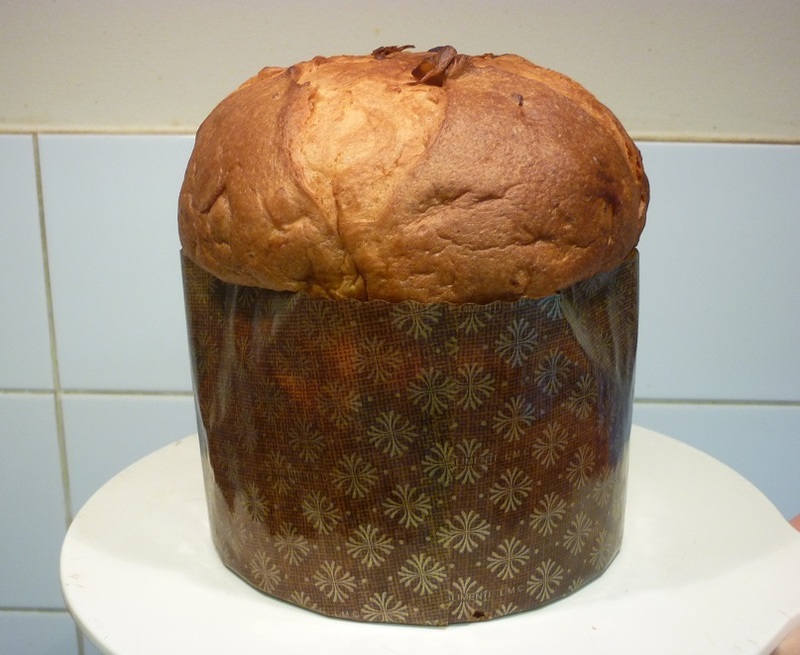 Here also is a recipe entitled Panettone Brio integrale. They look just as light and fluffy as one made with white flour. Thanks for the links. Interesting in that I just got some paper pans like the ones pictured - not the usual tall ones so I now know I can use them when I do my panettone bakes. One thing I haven't solved it the hanging upside down part yet so maybe this year that will be my 'challenge'. Will have to keep a look out for wooden skewers when I am out and about. I remember discovering panettone and it is now firmly part of Christmas. If made right an artisan panettone can be saved for about 90 days. Too much acidity would cause quicker staling. But commercial panettoni include mono and di-glycerides which act as emulsifiers and help delay staling. This looks great Michael. You certainly are the King of Panettone! Very kind of you to say so.. Very kind of you to say so.. Thanks Ian. This just looks amazing, your panettones are beautiful and I bet they're as delicious! Will just look and dream for now, not sure I can achieve anything like this. Thanks for the recipe, it's something I aspire to try one day. Well done! Nutritious and delicious! But I have to thank the micro-organisms for their work. If you want to try this and have any questions, I am here to help. Every year I tell myself that I'm going to make a Panettone or Pan de Oro, but end up wussing out and figuring it's too hard because I didn't have a stand mixer. This year I have one, so I suspose I can't use my usual excuse! Perhaps I'll give this one a shot. from my italian point of view this is a perfect looking panettone and I Am pretty sure it is delicious. 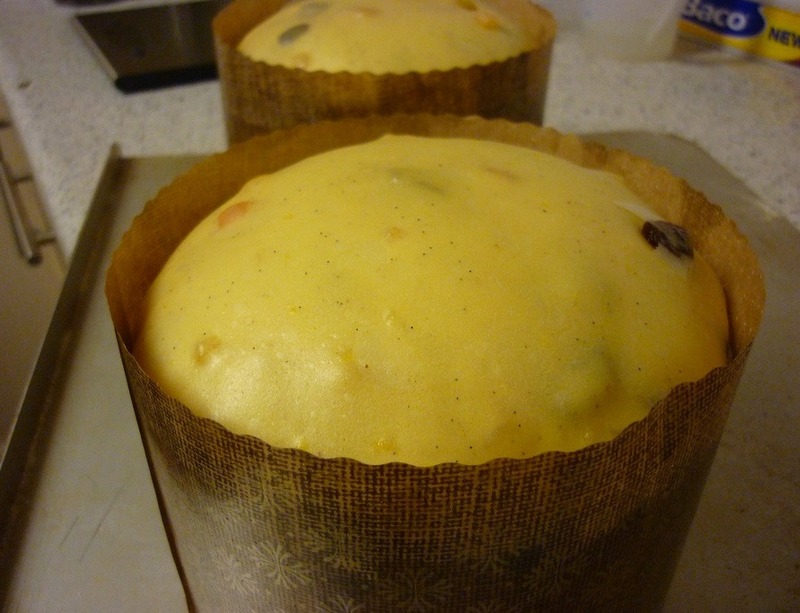 I made panettone few times myself, with mixed results. in general whatever I tried from American sources was not the real thing (e.g Peter Reinhart' s version), Italian recipes, from good sources, were always more complicated but gave better results. I have one question for you: do you turn the panettone upside down as soon as it is out of the oven, as Giorilli says, and how do you do that? in the past I used to spear the panettone with long knitting needles and then I would let it hang between two chairs. Do u have a better way? + do I understand correctly that the lievito madre/levain used is a firm one? As for the icing: that is really personal. I am from Milano and the panettone sold there by many reputable patisseries do not have any icing as it would not be considered traditional otherwise. I prefer it myself without icing, which I think distract from the crumb...but It is really personal. Thank you very much. It has taken a few years and many, many panettoni later I feel rather adept. I remember trying reinhart's version at the beginning of my journey and yeah, it's a pretty terrible recipe! It's only worth following a recipe from the masters, Giorilli, Massari, Morandin to name a few. But of course you must first understand how to make a suitably mature lievito madre which yes is firm at 50% hydration or less and is key to success. The cooked panettone needs to be hung upside down straightaway, I use metal BBQ skewers and hang them just as you describe. Mostly I use a pile of DVD's to hang them over. Whatever is convenient, works! Sure the Milanese style without the icing is most traditional but the icing is a nice modern touch and it can really help to boost the rise in the oven. PS. I had a look at your website and it was nice to read about your work. I'm a trained chef and I have worked at various restaurants and pubs. If you ever need help with making panettone, I would be happy to advise you. thanks for your reply. I have just been eading your blog - lots of interesting stuff. I will write to you from there because I do not want to go off topic here. Anyway, looking over the translation of the formula, two things are not quite clear to me. 1) The hydration of the lievito madre - I keep my starter at about 80% these days. Should I convert it to 50%? Drier? Wetter? 2) Desired dough temperature - It looks like there's some temperatures listed for the proofing environment, but I'm not sure what temperature the dough itself should actually be at the conclusion of mixing. I imagine that with the long proof times, the dough will eventually reach equilibrium with its environment, so maybe I should just assume that proofing temp = dough temp. 28 C seems quite high for an enriched dough though. Sorry I've been away celebrating my birthday. Yes the madre hydration is assumed as 50%, it is standard. Should you convert it, well that's up to you.. might be a good idea! I am a raging alcoholic on the brink of turning 30!!!!!!!!!!!!!!!!!!!!!!!!!!!!!!! Wow, Michael. Every year, you impress the hell out of me with these. Good thing you live in the UK. If my wife met you, I'd be toast! Her absolute favorite around Xmas time. I'm totally amazed by your recipes using the Italian sourdough starter aka pasta madre. It's been a big dream for me to make sweat breads, such as panettone with pasta madre, but unfortunately I failed to make a proper pasta madre. I tried several ways, converting my 100 % RH starter to 50 %, and from scratch but it did'nt work. Could you make a post about you pasta madre, how did you make it, how do you keep it alive and so on. I would be very grateful. I plan to post a tutorial at some point but of course, having time is always a factor. I also have other technical articles I want to write. Pasta madre or, lievito madre is simply a sourdough starter that meets certain technological parameters. I have made them with varying methods. It really doesn't matter how it is started, it's the maintenance routine that counts. If you haven't already seen it, have a look on my blog here: http://staffoflife.wordpress.com/natural-yeast-lievito-naturale/. While this is just a general outline it may prove helpful. Hi Michael, great stuff. I am new to this website and it has been very beneficial so far. I have been making panettone for a few years now around the holidays and was very successful last year using a combination of the matt tinder recipe (http://mattsgonefishing.tumblr.com/post/104724000043/chocolate-panettone) and the Wild yeast blog (http://www.wildyeastblog.com/panettone/). I will post a picture of my recipe later today. This year unfortunately, I have been only mildly successful. I am unsatisfied with the texture of the dough this year. It keeps coming out fragile and lacks gluten. I was planning on trying this above recipe this weekend. I was wondering if you had other recipes that were perhaps "less forgiving", just because I do have some experience with panettone (not nearly as much as yours). I was also wondering if you had any immediate thoughts based on the matt tinder recipe. It seems to me, to be a very rich recipe, utilizing a significant amount of butter, and it is in adding the butter that my gluten usually breaks down. And what flour are you using? I have used the Antimo Caputo long fermentation flour and the King Arthur Bread flour. Thanks for your comments and welcome to the forum. I find this one very difficult and may be less forgiving. I've become aware of Matt Tinder's recipe only recently and I'm not so familiar with as yet. It seems quite similar to this one from Giorilli. I have used a number of different flours in the past but currently I am using Mulino Marino's Soffiata flour. Thank you Michael for your comments. Once I figure out my current issue I may give that recipe a try. Happy holidays. I know your comment is from a while ago but if your dough is breaking down when adding butter the dough might over acidified. High acid in the dough can prevent it from being able to hold fat. This could go back to a madre maintenance issue. Make sure you're washing it and take it through several days worth of feeding cycles with proper night time storage before using it. With panettone it's possible that it's a million other things too. I am so excited to try this recipe. I am curious about the timing used in this recipe. In one recipe I saw, after the first mix the dough proofs for 7 hours. Then after the second mix, there's a 5 hour proof, followed by a a pre-shape (30 minute rest), and final shape (6.5-7 hour final proof). Did you use similar timing? I am also curious about how much development you are going for during the mixes. this seemed like a good spot to ask this question, i have seen it sporadically around TFL. wondering about the weights people use for their molds. I have been ostly successful with a 0.38 x volume of mold = amt of dough (g). But this seems not to work with the large basso molds.and the baked bread then falls out when flipped. it still tastes great but obviously has fallen onto the floor. so does anyone have any insight on the amount to use in any molds and especially in the large basso molds?